The spa's Persian Garden on board Celebrity Solstice. Light, bright and big on options; it’s cruising, but not as you know it. Nikki Wallman jumps on board the Celebrity Solstice and revels in the elegance. Whoever had the idea of installing a half-acre of real, lusciously green grass on the top deck of the Celebrity Solstice should be given a medal. There’s something deliciously odd – but innately satisfying – about curling your toes into the soft lawn as you sip chilled white wine, gazing out at the stunning sunset as the mammoth vessel churns quietly through the sea. Celebrity Solstice in Sydney Harbour. After a week on board this ship I decide that in cruising, as in life, sometimes the simple pleasures like these really are the best. Sure, you can compare bells and whistles – every cruise ship these days has (ahem) a raft of them. But, when they do a few key things really well, you’ve a winning formula. Launched in 2008, the 16-deck, 317 metre-long, 2850-capacity Celebrity Solstice offers upmarket, modern cruising on a grand scale, with some notable features that ratchet it up a few notches from what you might expect of a ship in its price bracket. Upon boarding, my husband and I gaze awestruck at the weeping fig tree suspended in the central atrium area before heading to our veranda [sic] stateroom to unpack. In muted caramels and whites with warm red accents, it’s compact but cleverly designed, with enough storage for even chronic over-packers like me (the rooms were designed by women). The spotless modern bathroom also cleverly uses the available space. We embark on a gym reconnaissance mission, having already spotted a créperie, gelato bar, and molecular cocktail bar. It’s nestled in the front area of deck 12 along with the AquaSpa, where I enjoy an Elemis Oxydermy Facial, combining microdermabrasion and oxygen. I’m often left underwhelmed by facials – and being on a mid-range cruise ship, my expectations aren’t the highest – but this one packs a rejuvenating punch. The Celebrity Solstice offers everything from metabolism testing and fat-burning seminars to yoga and personal training in the large, well-equipped fitness centre. 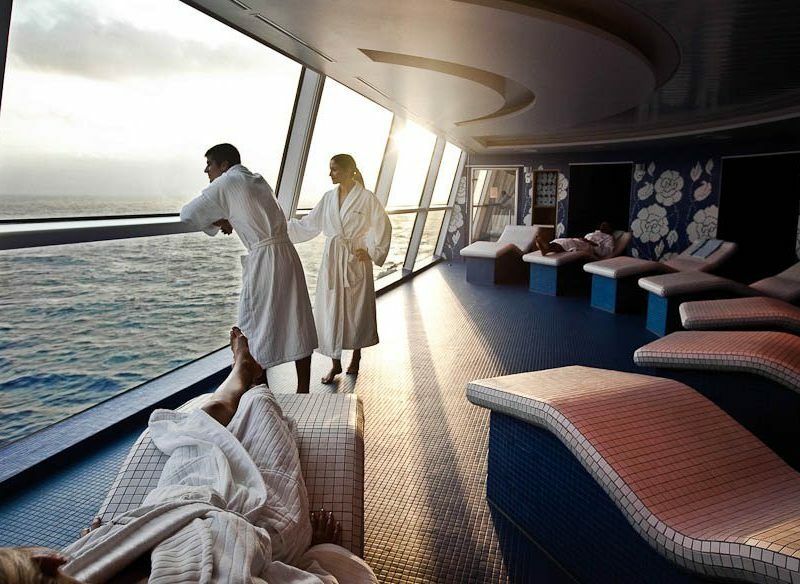 In fact you could treat your cruise as a health retreat – particularly if you book an AquaClass room. These guests rave about their exclusive ‘clean eating’ restaurant, Blu, and free access to the Persian Garden: a soothing, Mediterranean-themed oasis with heated ceramic tile beds and adjoining steam rooms. One rainy day, in the Persian Garden, one woman confides she’s on the Solstice to “actually enjoy the ship itself” after joining other cruises for the destinations. 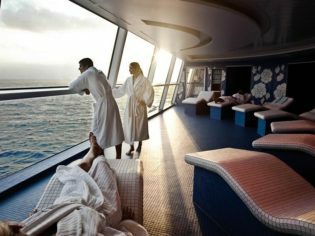 Celebrity guests seem to be loyal – almost half the passengers on board are repeat customers, and over 400 have done 10 or more Celebrity cruises. Although it’s definitely not all about health on board. The array of dining and drinking experiences could seriously blow a diet – and the budget, if you’re not careful. Alcohol and most other beverages aren’t included, though a range of packages can help keep costs under control. We go for the premium package – it’s not cheap at $62 per person a day, but for wine lovers like us it’s probably more cost-effective than paying as we go. Each specialty restaurant – Italian-themed Tuscan Grille, pan-Asian Silk Harvest, and what executive chef Robert Sawyer calls the “pearl restaurant of the fleet”, French restaurant Murano – attracts a surcharge (around $30-45 per person). The meals are delicious: from flambéed lobster tail and fantastic French cheeses at Murano; to buttery-soft filet mignon with truffled parmesan fries at Tuscan Grille, and the fantastic steamed buns filled with barbecue pork at Silk Harvest. The meals in the Grand Epernay general dining room are also, overall, very good. Its light, airy design was apparently inspired by champagne bubbles. But while the menus have been somewhat adjusted for Australian tastes and most produce sourced locally (fruit and vegies from NSW and Qld, and much of the seafood from Sydney markets), an American influence pervades – from the ubiquitous breadbaskets to large portion sizes, and much of the buffet-style food on offer in the Oceanview Café where we eat breakfast and lunch. If you don’t mind the odd American staple, like ‘craisins’ or walnuts, in your food, the overall quality of the food remains pretty impressive. Especially considering the sheer scale of the operation – on formal nights the kitchen prepares up to 2000 lobsters. Similarly French-inspired baked treats are deposited around the ship 24/7, courtesy of 31 pastry chefs on board. Days could be spent in a panic, trying to sample everything: golf putting, pool volleyball, ‘Thriller’ dance classes, scientific lectures, hot glassblowing, art auctions, late-night comedy and theatrical shows. It’s not all to our (early-30s) tastes, but that’s fair enough – the average age of our fellow passengers on this particular cruise skews 55+ (though Celebrity Cruises are generally also well-suited to families). The real beauty of a ship this large is that we soon settle into our own routine: a good workout followed by a lazy breakfast; reading by the pool; afternoons spent chilling out in the Persian Garden while my husband shoots hoops on the basketball court; checking out the artworks scattered all over the ship (bathrooms included); sunset drinks at the Lawn Club; chatting to the knowledgeable sommelier at the Cellar Masters wine tasting room after dinner; and coming home, full and happy, to our animal towel-art thoughtfully prepared by our lovely room attendant. The octopus was a cracker. As I said, it’s the simple things.